Interactive Map Location of Hekate Town in Torren. Hekate Town is a small town located in northwestern Torren. The town is split into three separate sections that are connected by glowing orbs placed in each section which, when stepped on, teleport the player to a different section of town. The townspeople take pride in the use of magic to make everyday living easier. 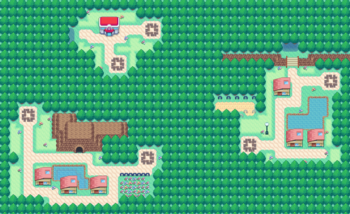 After healing at the Pokémon Center, take the portal east of it. Speak with the Hiker near the entrance to Route 12 to start the Spider Quest in Murk Forest. The Fiery Cavern is said to be a hotspot for tourists but is being invaded by Infernal Cultists when the player arrives in the town. Several Fire-type Pokémon are found inside. After defeating Diana at the Selene Gym, a scientist appears beside the Pokémon Center who has been researching the portals spread throughout town and is thus able to teach the player's Pokémon various Psychic-type moves. Wild Pokémon can be encountered by surfing or fishing in any of the town's two ponds. A person in the house directly southeast of the PikaTaxi is willing her Haunter for the player's Machoke. A man dressed in black in the house furthest from the PikaTaxi will sell a Munchlax egg to the player for 2500. Hekate Town is one of the newest towns of the Torren region, according to a few of Hekate Town's inhabitants. It was also created solely to alleviate the difficulty of traveling from Nasca Town to Selene City. Both Hekate Town and Selene City are said to be considered taboo by many people within the Torren region for experimenting with and researching magic. Hekate Town and Kepler City are suggested to be opposites of each other due to Kepler City's reliance on science and overall higher cost of living in the city.